Erie County Medical Center has established itself as a community dedicated to providing quality care to patients in eight counties throughout Western New York and Southern Ontario. In an effort to expand their resources to better serve their patients, ECMC invested in their existing assets. 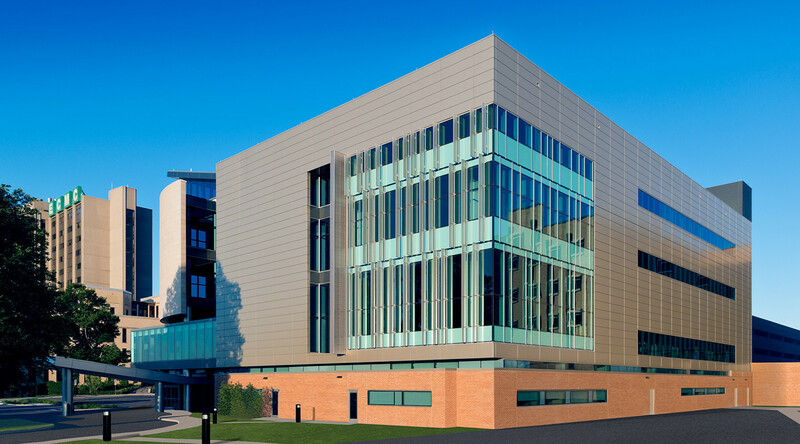 Part of a five-year plan to revitalize the ECMC health campus, the Regional Center of Excellence for Transplantation & Kidney Care brings a new level of specialized healthcare to Buffalo, New York, while setting a new standard for high-performance building envelopes in healthcare design and construction. 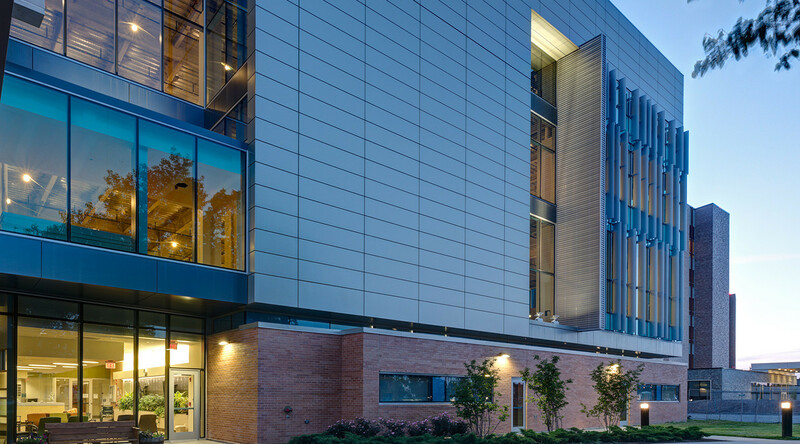 For the transformation of the building, metal was specified to align with ECMC’s sustainability and aesthetic goals. 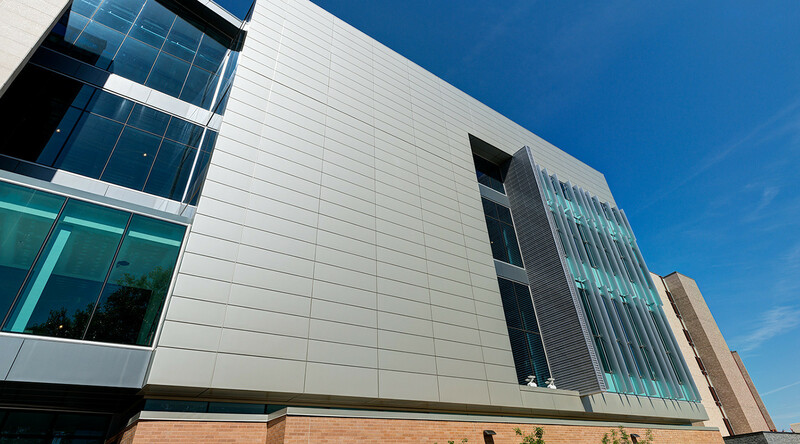 Thus, the medical center was the first building in the nation to take advantage of CENTRIA’s Smart-R Wall, combining Formawall 3”-T insulated metal wall panels with an insulated metal vertical joint (IMV), Formavue FV-600 windows and integral components such as CS Louvers. The result was one of the most efficient wall systems on the market. CENTRIA’s Smart-R Wall Solution offered an unmatched level of integration, allowing the architect to specify a wall system with dynamic aesthetics without sacrificing performance. Integrated systems also minimize detailing, which helped keep the Regional Center of Excellence on schedule. “Aesthetically, with an integrated system the entire envelope appears more consistent in detailing and finish,” AIA architect John Keelan explained. 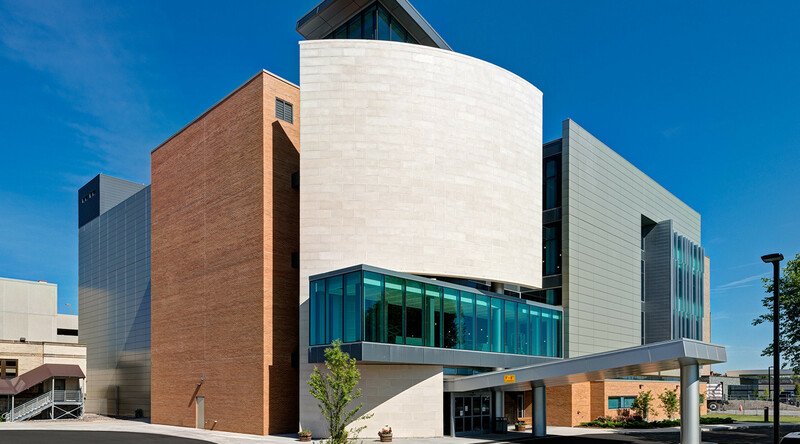 As a Project Manager with IKM Incorporated, Keelan served as designer and lead architect on the ECMC Regional Center of Excellence for Transplantation and Kidney Care. Keelan specified CENTRIA’s Smart-R Wall Solution to provide optimal thermal performance in the face of Buffalo’s notoriously heavy winters. Efficiency was critical in the construction. Integrated components reduced the amount of material used by eliminating extraneous parts such as receptors or exposed sealants, while factory-assembled components eliminated jobsite scrap. Moreover, high-performance wall systems drastically reduced HVAC costs and overall environmental impact. Combining a steel face and liner and closed-cell, HCFC-free foam insulation, Formawall products are strong but lightweight, weighing considerably less than comparable precast, clay brick or insulated glass building materials. The manageable weight reduces structural support requirements and cuts installation and material costs to minimize energy consumption. 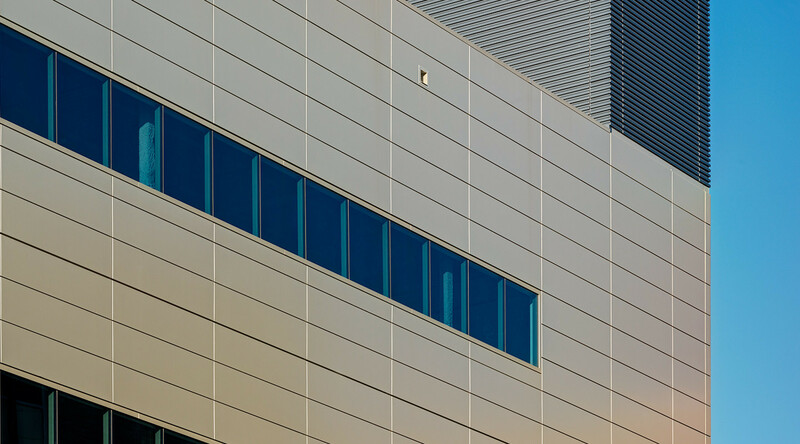 Formawall Dimension Series 3”-T panels were specified to clad the façade. The panels use a factory foamed-in-place core to minimize insulation gaps, while a thermal break between metal face and liner minimizes heat transference. The panels also offer thermally enhanced panel joinery, and the insulated metal vertical joint (IMV) is the only foam panel product that offers a four-sided metal joint for added aesthetic flexibility and superior thermal performance. All told, the Formawall 3”-T panel produced an impressive R-value of 22. Formawall panels feature pressure-equalized and vented dry seal joinery, and the optional Formawall PE Seal Plate is available to add multiple lines of defense against moisture intrusion in the form of integral gaskets, a vented drain channel and non-curing butyl seals. In addition, Formawall panels include integral air and vapor barriers and unexposed sealant—ideal for moist climates. Formawall provided a complete wall system for optimal performance in a single component. While traditional wall assemblies require up to seven separate components and multiple installation steps, Formawall panels form a weathertight barrier after one pass. The product’s single-panel design saves money and reduces construction time—all while eliminating the potential for breakdowns commonly associated with multi-component systems, such as moisture buildup, corroded studs and mold.